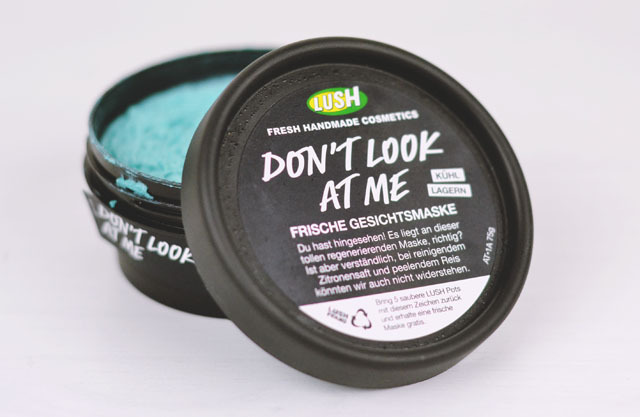 I'm not gonna lie, I only wanted this Don't Look At Me face mask because it's bright blue. What other reason is there really? I bought it in Lush Vienna along with my Honey Trap lip balm and the intention was to have a little pamper session every evening in my hotel room, then use the empty pot to dispense the bulkier liquids and save space in my bag for the flight home. In true Becky style, I used it once and then had to somehow squeeze an extra pot of liquid into the little clear bag. Great work! I'm going to skip the usual "application" paragraph here because, come on, it's a face mask. It has a thick clay-like texture and you apply a thick layer with your fingers. We all know how this works. You look like a Smurf when it's on so that's a fun bonus. Anyway, the results. Although I didn't find my skin looked any brighter, the butter definitely did moisturise it and leave it feeling soft, but then all Lush masks do in my experience. Since I have never finished a face mask, I've started putting them on Rich just so they don't go to waste. Conversely, he found that it made his oily skin feel dry and tight but I'm not sure how much I trust his skincare advice, to be honest. Although it is a nice mask- and the whole Smurf thing is fun, I admit- I probably won't be buying it again. Lush has masks with much nicer fragrances and more dramatic effects for my skin type. I really recommend Catastrophe Cosmetic for a cooling, calming mask. Ooh this one sounds interesting. I think my favourite Lush mask is the magnaminty one. Tofu is apparently good for adding moisture into your skin and helping to soften wrinkles thanks to the protein. Still a weird one to use!